Lazed in bed til 8 a.m. By 10 I'm out visiting. Frank has taken a nice walk. We ride our bikes a bit. After lunch we play cards with Joan and Harold. Then we all walk to the store for ice cream. We drive across the highway to the beach. It's a nice beach but too far for me to walk. We may drive there tonight for grunion hunting. I make chicken enchiladas for our potluck dinner. They turn out real good. I take 2 plates of cookies as well. We have lots of good food, then some play cards. Frank plays. I watch a video. About 11:30 we all go down to the beach to catch grunion. No grunion. We're in bed by 1 a.m.
What is this grunion hunting? From the time my brother and I were very small my parents would drag us to the beach in the middle of the night at least once every summer to go grunion hunting. We would be bundled up in blankets trying to keep warm. It was always cold and sometimes it was foggy too. I never saw a grunion. I thought it must be a myth, so I did a little research on the subject. The California Department of Fish & Game says, "Along southern California's sandy beaches, from March through September, one of the most remarkable life cycles in the sea is completed; the California grunion comes ashore to spawn. The grunion has been known to many southern Californians for more than 70 years, but there are still those who are skeptical of its existence. To be invited out in the middle of the night to go fishing with only a gunny sack and light for equipment does sound a little ridiculous, but in reality this is the most popular method. 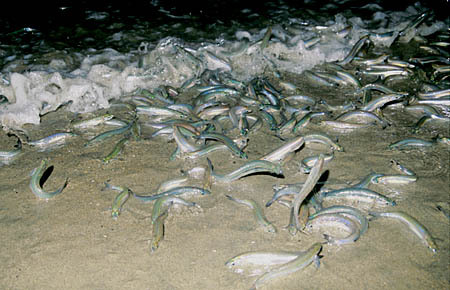 California grunion are small silvery fish found only along the coast of southern California and northern Baja California. Most sportsmen would be unaware of their existence were it not for the unique spawning behavior of these fish. Unlike other fish, grunion come out of the water completely to lay their eggs in the wet sand of the beach. As if this behavior were not strange enough, grunion make these excursions only on particular nights, and with such regularity that the time of their arrival on the beach can be predicted a year in advance. This phenomenon can be seen on many beaches in southern California. Shortly after high tide, on certain nights, sections of these beaches sometimes are covered with thousands of grunion depositing their eggs in the sand. Grunion hunting has become one of the famous sports of southern California. Since these fish leave the water to deposit their eggs, they may be picked up while they are briefly stranded. Racing for fish spotted far down the beach and trying to catch them by hand provides an exhilarating experience for young and old. The common sight of thousands of people lining the more popular beaches in southern California in anticipation of a grunion run attests to its ever growing popularity. Often there are more people than fish, but at other times everyone catches fish. All that is needed to catch grunion is a valid State fishing license and a willingness to get one's feet wet.